For this fortnight Patter gave us the word "Assurance" for our art and also have us a very thought provoking devotional thoughts. 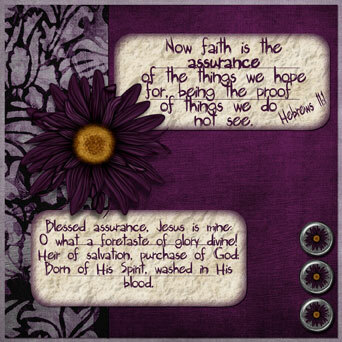 Once I read the word that Patter had chosen, the old hymn by Fanny Cosgrove - Blessed Assurance came to my mind so I have shared the first verse on my artwork. The digital kit I used for my art is called Midnight Magic by Digi Illusions. Anne-Marie, what a wonderful page and I love that song. Thanks for sharing. Beautiful page and love the verse and hymn you've used! Just gorgeous!